I was lucky enough to receive several new cook books over the festive season. I’ll report on these as and when, but first to make it from the lounge to the kitchen was NOPI – a much appreciated gift from Grandma and Grandpa Battenburg. This is the latest book from Yotam Ottolenghi, a joint venture with Ramael Scully, and is based on the food they serve at NOPI, which is, apparently, a more grown up affair than the Ottolenghi restaurants (which have never seemed particularly juvenile to me!). Ottolehnghi declares the recipes to be a bit more complex than those in some of his previous books – the recipe I chose first had several component parts, but actually all very manageable to make. I happened to be hanging out in Marylebone for the first Prosecco Friday of the year (in fact the first actual Friday of the year) with the lovely Catherine P, so after a very jolly lunch, I popped into the Ginger Pig and bought a poulet Landes. 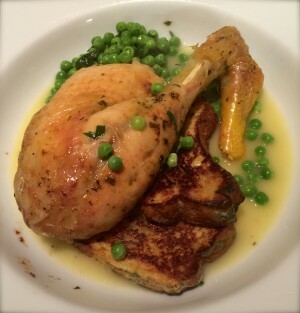 I decided to try out the chicken supremes with roast garlic and tarragon brioche pudding. Rather than grapple with turning a whole chicken into pieces, I adapted the recipe and roasted the chicken whole, with lots of tarragon and thyme. I also aspired to bake the brioche, but ran out of time and hot-footed it in the pouring rain to M&S for a brioche loaf. Other than that, I did pretty much what Ottolengi and Scully told me to do. The brioche pudding was like a savoury but also sort of sweet bread and butter pudding – more herbs and lots of garlic (two heads to be precise). You bake the pudding and then fry up slices to serve with the chicken and a pea and tarragon jus – made with some chicken stock I had in the freezer from some previous poultry-based adventure, lashings of butter and, obviously, peas and tarragon. A very delicate and delicious combination of flavours. The rest of the brioche pudding made a fine accompaniment to Sunday brunch. There was also enough chicken and jus left to make this perfect Sunday comfort food pie – I defrosted some pastry, fried up some finely sliced leek, made a béchamel sauce with part milk, part pea and tarragon jus, lots of nutmeg, added the last of the chicken and a few bits of chopped up ham. I even found a biscuit cutter that looked as though it might be meant to be a chicken, so I decorated the pie with a few of those. Put it all in a saucepan and cook over a low heat for about 20 minutes. The timings and quantities are, to be honest, estimated – it doesn’t seem to matter too much. This quantity ought to serve four diners, but frankly it just about does two – it’s one of those dishes that just all gets eaten. Anyway, based on this first outing of my new book, I think it’s time someone took me out to dine at NOPI. So am I to understand that every Friday is Prosecco Friday? That is a shame, because you will be missing out on Cava. Unless of course that is for all the other days of the week, except for Saturday, which is reserved for Champagne. Sadly Prosecco Friday does not take place on a weekly basis, it is more of an ad hoc thing. But we wouldn’t dream of ruling out Cava! I can testify to the deliciousness of both the pie, and the peas in the French style – yum yum! I will keep you posted about further adventures with the book – it is fabulous! Yes – someone must take us there very soon!